This recipe for Polish herring rollmops or rolmopsy marynowany w oleju (rrohl-MOHP-sih mah-rrin-oh-VAH-nih vef oh-LAY-yoo), or "rollmops marinated in oil," is from chef Marek (Mark) Widomski, founder, and director of the Culinary Institute in Cracow, Poland. It calls for whole salt herring that you clean and marinate yourself. It will take at least three days to pickle the herring, so plan accordingly. If you can't find whole salt herrings at an ethnic deli, Nordic House is a good online source. 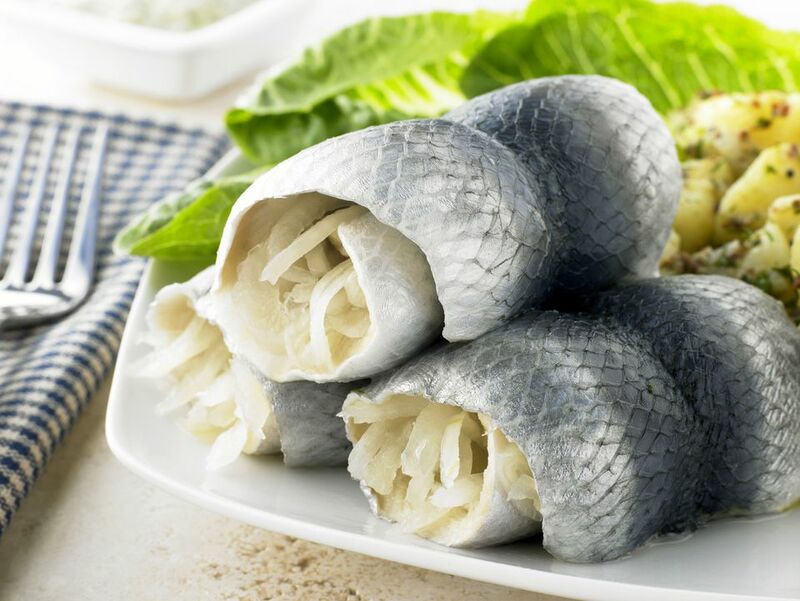 Traditionally, unskinned Bismarck herring fillets are used to make rollmops, a name derived from the German rollen or "to roll" plus mops or "pug dog." The connection to the pug dog is less clear. Rollmops are easily prepared at home and recipes vary by region and taste. But, typically, salted herring fillets are soaked in water, spread with mustard and rolled up with a piece of pickled gherkin or pickled onion in the middle. A toothpick holds its shape. The rolled fillets are then transferred to a preserving jar and topped with a warm marinade made from vinegar, water, chopped onion, peppercorns, bay leaves, and mustard seeds. The rolls are marinated in the refrigerator for up to five days at which time they are ready for consumption and can then be stored in the refrigerator for up to 10 additional days. Here's another Polish rollmops recipe that is made with purchased marinated herring. All you do is stuff and fill them. And in this recipe for Herring in oil from chef Marek, cleaned salt herring is not rolled but simply cut into bite-size pieces and marinated in oil and spices for several days. Remove the heads from the herrings. Soak in a large pan of cold water about 24 hours, changing the water two to three times. To clean, make sure there are no scales on the fish. Slit the belly and remove the intestines. Remove the milt from male herring and set aside. Remove the roe from female herring and discard it. Wash the herring cavities well. Remove the bones. You should have 8 fillets. Spread each with some of the pepper, mustard, and onion. Place a pickle portion at the small end or large end of the fillet, as you prefer, and roll up, securing with a toothpick. Place in a clean, sterilized jar. Continue with remaining fillets. In a small saucepan, bring vinegar, water, bay leaf, and any remaining chopped onion to a full rolling boil. Let cool to lukewarm. Remove milt, if using, from sac and rub it through a sieve into the vinegar mixture. Add oil and sugar, and mix well. Adjust seasonings, if necessary. Pour lukewarm pickling liquid over herring. Cover the jar and refrigerate three to five days at which time the herring will be ready to eat. It can be refrigerated for up to 10 additional days. This can be served as an appetizer or a main course with boiled potatoes and rye bread.